[137 Pages Report] The global benzoic acid market is projected to grow from an estimated USD 1009.9 million in 2018 to USD 1313.5 million by 2023, at a CAGR of 5.4% during the forecast period. Benzoic acid is a simple aromatic carboxylic acid. It is produced commercially through partial oxidation of toluene with oxygen. It is also found naturally in various plants. Benzoic acid is used as an intermediate product in the manufacturing of salts such as sodium benzoate, potassium benzoate, phenol, and alkyd resins, among others. Food & beverages, chemical, and pharmaceutical end-use industries use benzoic acid in various applications. The base year used for company profiles is 2017, and the forecast has been provided for the period between 2018 and 2023. Benzoic acid is primarily used as a preservative in packaged food items & beverages. It is majorly used to preserve acidic food items & beverages such as pickles, jams, fruit juices, aerated drinks, and sparkling drinks, among others. The increased use of benzoic acid as a food preservative can be attributed to the fact that it does not alter or affect the odor or taste of the food items or drinks to which it is added. The growth of the food & beverages end-use industry segment of the benzoic acid market is also due to change in the consumer preferences for packaged food items & drinks, and increased per capita income of consumers. There is also a significant growth witnessed by the processed and packaged food & beverages industry due to the increased demand for frozen food items & drinks across the globe. The growing food preservative market in China and India is expected to drive the growth of the food & beverages end-use industry segment of the benzoic acid market across the globe. The research methodology used to estimate and forecast the global benzoic acid market began with capturing data on key vendor revenues through secondary sources, such as Hoovers, Bloomberg, Chemical Weekly, Factiva, and various other government and private websites. Vendor offerings have also been taken into consideration to determine the market segmentation. After arriving at the overall market size, the total market was split into several segments and subsegments, which were later verified through primary research by conducting extensive interviews with key personnel, such as CEOs, VPs, directors, and executives. Data triangulation and market breakdown procedures were employed to complete the overall market engineering process and arrive at the exact statistics for all segments and subsegments of the market. The breakdown of profiles of primaries is depicted in the figure below. 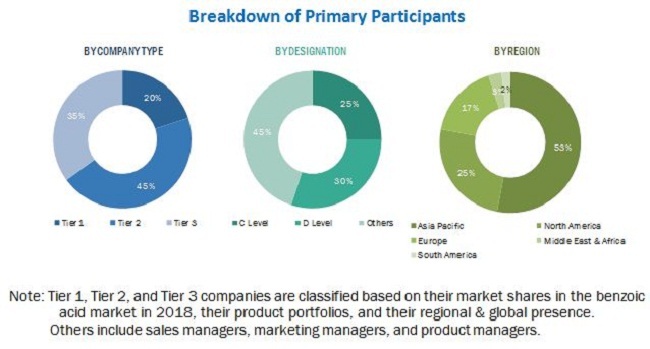 The benzoic acid market has a diversified ecosystem of upstream players, including raw material suppliers, along with downstream stakeholders, vendors, and government organizations. Companies operating in the benzoic acid market include Emerald Performance Materials (US), Wuhan Youji Industries Co. (China), Tianjin Dongda Chemical Group (China), and Liao Ning Huayi Chemical Industry & Commerce Co. (China), among others. This research report categorizes the benzoic acid market based on end-use industry, application, and region, and forecasts revenues as well as analyzes trends in each of the submarkets. Further breakdown of the Rest of Asia Pacific, Rest of the Middle East & Africa, Rest of Europe, and Rest of South America benzoic acid markets. 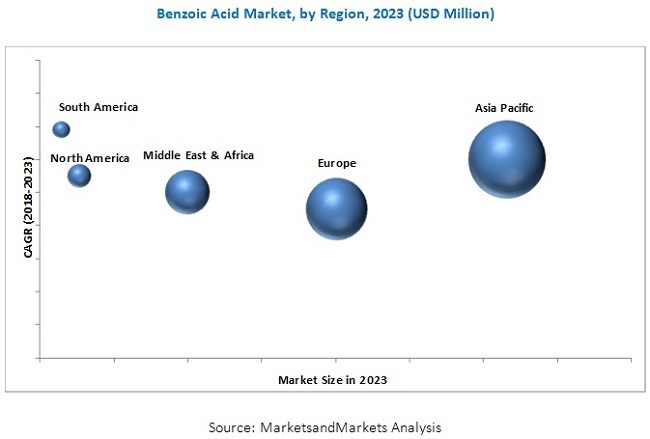 The benzoic acid market is projected to grow from an estimated USD 1009.9 million in 2018 to USD 1313.5 million by 2023, at a CAGR of 5.4% from 2018 to 2023. Benzoic acid is extensively used to manufacture sodium benzoate and potassium benzoate which are also known as its derivatives. The benzoic acid unit market, by application is segmented into benzoates, benzoate plasticizers, benzoyl chloride, alkyd resins, animal feed additive, among others. The benzoate plasticizers segment is expected to grow at the highest CAGR during the forecast period due to the growing demand for non-phthalate plasticizers, which include benzoate plasticizers in various applications such as flooring & wall coverings, wires & cables, and consumers goods, among others is driving the growth of the benzoic acid market globally. By end-use industry, the benzoic acid market is segmented into chemical, food & beverages and pharmaceutical. The food & beverages segment accounted for the major share of the overall market in 2018 during the forecast period. The ongoing urbanization and changing lifestyle of masses are the factors leading to the increased demand for packaged food items. Benzoic acid, which is majorly consumed as sodium benzoate and potassium benzoate, is directly used as a food preservative in the food & beverages end-use industry. Thus, increase in demand of food packaged sales leads to the growth of the benzoic acid market across the globe. South America is expected to be the fastest-growing market for benzoic acid during the forecast period. The South American countries have huge growth prospects for the benzoic acid market because of the growing applications of refrigeration in various end-use industries such as chemical and pharmaceutical. The growth of the pharmaceutical end-use industry segment of the South America benzoic acid market can be attributed to the flourishing pharmaceutical industry in the region, which is growing at a rate of 12%, annually. The benzoates application segment of the benzoic acid market includes sodium benzoate and potassium benzoate. The growth of the benzoates application segment of the benzoic acid market can be attributed to change in consumer preferences for packaged food items & drinks and increased per capita income of consumers. Benzoates are used as food preservatives in pickles, jams, fruit juices, soft drinks, etc. There is also a significant growth witnessed by the processed and packaged food & beverages industry due to the increased demand for frozen food items & drinks across the globe. Benzoate plasticizers are used in the building & construction industry in the form of wires & cables and flooring & wall coverings, among others. In the past few years, researchers have found that phthalate plasticizers cause severe harm to human health, thereby resulting in breast cancer, neurodevelopmental issues, etc. Thus, there is a growing demand for phthalate-free plasticizers, and benzoate plasticizers fall under this category. Alkyd resins are used in furniture & architectural coatings, product finishes, and automotive refinishing primers. Benzoic acid is used across a range of applications in various end-use industries due to easy availability of pure quality alkyd resins and their low development costs. Benzoyl chloride is used in several industrial applications to manufacture perfumes and resins, among others. The growth of various end-use industries such as pharmaceutical and cosmetics in emerging economies such as China and India is driving the demand for benzoic acid in the Asia Pacific region. What are the upcoming industry applications for benzoic acid? The growing concerns regarding harmful effects caused by excess consumption of benzoic acid on human health may adversely impact the growth of the benzoic acid market across the globe. Various regulations that mandate the manufacture and use benzoic acid have created complexities and uncertainties for manufacturers regarding the usage of benzoic acid in any food & beverages. This may also affect the benzoic acid market. Key players operating in the benzoic acid market include Emerald Performance Materials (US), Wuhan Youji Industries Co. (China), Tianjin Dongda Chemical Group (China), and Liao Ning Huayi Chemical Industry & Commerce Co. (China), among others. These companies focus on investing in capacity expansions of plants to achieve growth in the benzoic acid market. 10.12 Wuhan Youji Industries Co.
10.13.6 Liao Ning Huayi Chemical Industry & Commerce Co.
10.13.9 SAN FU Chemical Group Co.
10.13.11 Smart Chemicals Group Co.
10.13.16 JQC (Huayin) Pharmaceutical Co.